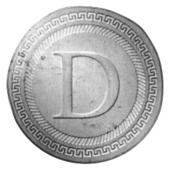 The first contest for Denarius is now running! Who can come up with the BEST Denarius meme? The meme you make must be posted here with a link to your Twitter account tweeting it, If you get the most retweets and "Thank You"s here on the forum you and the runner up will win. The contest ends 7/17/2017. One entry per person, no multiple accounts, if you are caught doing so, you will be disqualified and banned from the forums. Hahahaha amazing! These Memes are class!